The book of the week was Mojo by Marshall Goldsmith. I liked this book. It's a textbook self-help genre, and I think it definitely has the potential to do that with anyone. 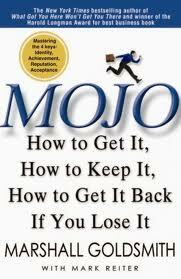 Goldsmith writes about how to get your Mojo going. There are several ways to test what gets your Mojo pumping, but there is one over-arching idea throughout the book and that is Acceptance and Forgiveness. There are several areas in your life that you need to use these ideas to become successful. It makes you successful because it enables you to focus on winning instead of the uncontrollable. Focusing on the uncontrollable is a cornerstone for most people's lives. It could be past, a life decision that your would have liked to have done different, or a colleague of whom you're jealous.In all of these areas it is important to accept the situation and then forgive the situation. It's completely out of your control. The past is the past and someone else's favor is none of your business. If you spend half the time you would normally spend on focusing on the uncontrollable, doing something of merit in an effort to change your future, you will astound yourself! Accept the uncontrollable situations and forgive yourself or others for the outcome, and move on. Short post on account of Christmas! Hope all of you had a Merry one... and I will see you back here next week to celebrate the New Year. I liked this book and it is really neat. I think Goldsmith is a good writer and I look forward to reading more of his work. As always, if you have any questions on the book don't hesitate to ask. I would be more than happy to help anyone that wants it.